A group of Missouri S&T students is preparing to travel over 9,000 miles to defend two world championship titles in events based on old-fashioned mining techniques generally known as “mucking.” Missouri S&T’s men’s and women’s teams both earned first place at last year’s competition, and this year they will head to Western Australia School of Mines to compete in the 37th international Intercollegiate Mining Competition in Kalgoorlie, Australia, as formidable contenders. Not only is the women’s team defending world champion, it has a legacy of success, having won the title in 2007, 2009, 2011 and 2012. Gold panning. Students must find five flattened lead shot or copper BBs in a pan full of dirt and mud. Hand-mucking. 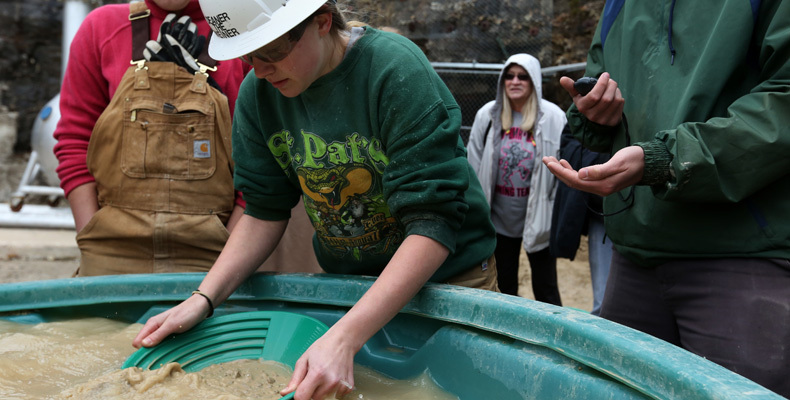 Students run an ore cart down a 75-foot section of track and fill it with “muck” — a combination of gravel and dirt — using shovels. Hand-steeling. Students drill into a block of concrete using a 4-pound hammer and a 7/8-inch-wide steel chisel. Jackleg drilling. Students drill into a vertical rock or concrete wall using a pneumatic air-drill. Surveying. Students are given a starting point and must report the coordinates of a finishing point using an old-fashioned Vernier transit. Track-standing. Students must set up and tear down a five-meter section of track, including sleepers, rail, connection plates and bolts. Although the women’s mucking team has a tradition of placing well, this year it’s up against a team with a strong home-field advantage. Missouri S&T’s teams will be in Australia March 20-April 4. While there, the team members will not only compete but visit with several Missouri S&T mining engineering alumni who currently work in Australia’s mining industry. Missouri S&T will take four mucking teams to the competition: one women’s, two men’s and one co-ed. Approximately 40 universities from around the world will send teams to compete at this year’s events.